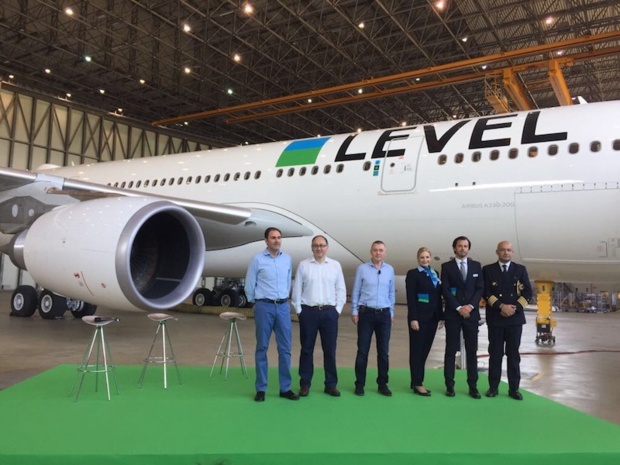 The new low-cost company of the group IAG inaugurated, on Thursday, June 1st, 2017, its first flight between Barcelona, its operational base, and Los Angeles. Its purpose: position on the long-haul low-cost where she will return at war against Norwegian. And according to the direction of IAG, low-cost Spanish aspires to become established on Paris from 2018. On Thursday, June 1st, 2017, at 3:40 pm, one of the two first Airbuses A330-200 of Level, the new low cost airline of his group, took off for the first time from its base of Barcelona El Prat, direction: Los Angeles. From Friday, June 2nd, Level will also fly away towards San Fransisco-Oakland at a rate of three weekly flights. And later in the month, the first two other destinations of low-cost, which at the moment beats Spanish detached house, will be opened: Punta Cana (in June 10th, two flights weeks) and Buenos Aires (in June 17th, three flights weeks). With a purpose clearly shown: ” to compete with Norwegian and to become one of the leaders on the long haul low-cost “, explains Willy Walsh. “From 2018, the fleet of Level will reach 5 planes, and in the longer term, we aim at 30 planes “, Willy Walsh confides ” But especially, we consider for the next year the opening of other bases in Europe”. Because if he evokes Rome and evades Madrid, the priority of the new low-cost would be in fact the opening of a second operational base on Paris, as fast as possible, according to the direction. ” Paris will be of a crucial importance for us “, explains M Walsh. According to him, the French market, thanks to the transport of the passengers in Barcelona via the flights Vueling, will be one of the major axes of the development of Level. ” This opening would allow us to go into high gear of our development “, he estimates. The project would be at the moment at the stage of the negotiations.